Happy Sunday friends! Did you have a good weekend? I can’t believe the first week of December is gone… Christmas is just around the corner! I’m certainly not ready. I feel like I still have so much to do: many items of my long list of to dos to check off. I haven’t even finished putting up my decorations. But in the midst of this business I made my first cross stitched ornament. 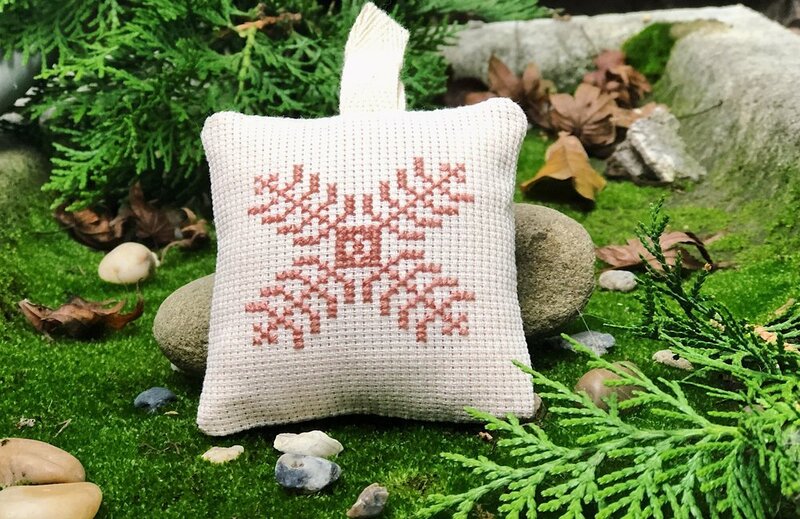 Nat from the blog Eat, Breath and Create is hosting a cross stitch Christmas ornament stitch along on Instagram and totally got me excited about dusting off my box embroidery flosses and hops and start stitching again. This is the first one of three different patterns on the stitch along. Next Tuesday she will put up another pattern. And I can’t wait to get started on the next one. The fabric for the ornament I naturally dyed with coffee grounds. I wanted my little ornaments to have a bit of vintage look. My motto is always use what you have and make it work. I have about two meters of crisp white cross stitching fabric in my stash that my dad had bought for me. So I decided to get creative and dye the white fabric. The process was super easy and I’m very pleased with the results. If you are curios about the process of dyeing the fabric let me know in the comments and I’ll be happy to make a tutorial about it.